HyperX Cloud Core sports memory foam headset is made of leather to provide maximum comfort. The performance is pleasant with all highs, lows, and mids clearly defined. Bass reproduction is well-enhanced, and the audio specifications mirror those of the award-winning HyperX Cloud headset launched previously. The HyperX is well optimized for gaming, and the detachable microphone and distinctive design have earned it a certification from TeamSpeak. The Kingston HyperX Cloud Core Gaming Headset is designed to be comfortable while being fully functional. The padded headband protects your head, and the leather memory foam ear pads mold according to the shape of your ear in order to enhance your comfort. A detachable microphone is also included so that you can talk according to your convenience. Ambient noise filters are also included so that your experience of using the headphones remains smooth throughout. The best part about this headset is the extendable cable which allows you to use the headset at any distance that is comfortable for you. The Kingston HyperX gaming system is designed to provide you comfort while blocking off all external noises and give you a great sound experience. It delivers exactly what it is supposed to. It may prove inadequate for the professional gamer, but for the amateur gamer who is looking for a quiet yet less costly experience, it does the job. This makes it one of the best gaming headsets out there that can be obtained for less than $100. The HyperX can also prove to be a good headset for non-gaming uses. It enhances the bass where required and offers clearly defined highs, lows, and mids for a fantastic sound experience. The headset looks sleek and comes with an extremely simple design. It is quite strong and gives you good value for the price. 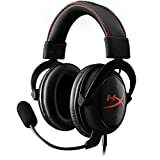 This should be your first headset of choice if you want a cheap and comfortable one. However, those interested in sound quality may be in for a disappointment. The headband may be padded, but it has been known to dig into larger heads, making it difficult to use for more than 90 minutes at a stretch. You can definitely find yourself much better headset models from Kingston, but if you are just an entry-level user or don’t see yourself spending a lot of money and still want great sound quality, this is definitely the model you should consider.